The Scania display head by Tech Lighting is clean and modern with its European-inspired head. This chic display head puts light where you need it the most by allowing for a full 360° head rotation and 180° pivot to direct light beam in the desired direction. The Scania head is available in two modern body colors and can be customized to hang at four distinct stem lengths. Diversify the overall look and feel of the Scania by combining with the Monorail or Monopoint systems by Tech Lighting. This low-voltage display head is ideal for commercial lighting applications such as retail stores, libraries and galleries. The Scania accommodates a fully dimmable MR16 lamp that is sold separately. Head rotates 360°; pivots 180° to direct the beam. Includes Snap Louver Lens Holder. Can hold a single lens or louver (sold separately). 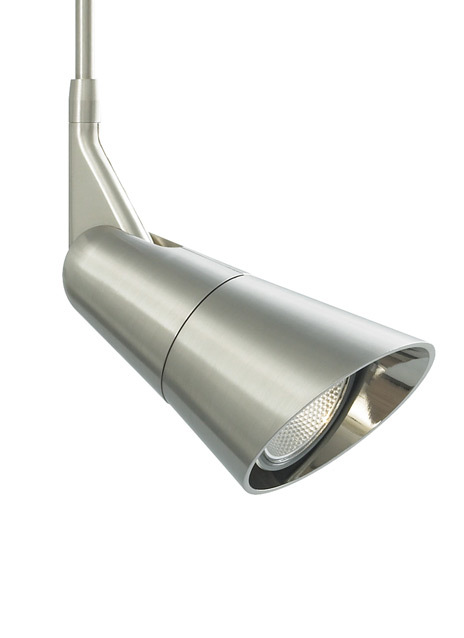 Low-voltage, MR16 lamp of up to 50 watts (not included).